Mayumi Oka is the Director of the Japanese Language Program in the Department of Asian Languages and Cultures at the University of Michigan. She is also Head Lecturer of the Japanese Pedagogy Course offered at the University’s Summer Language Institute. For four years beginning in 2007, she served on the board of the American Association of Teachers of Japanese. 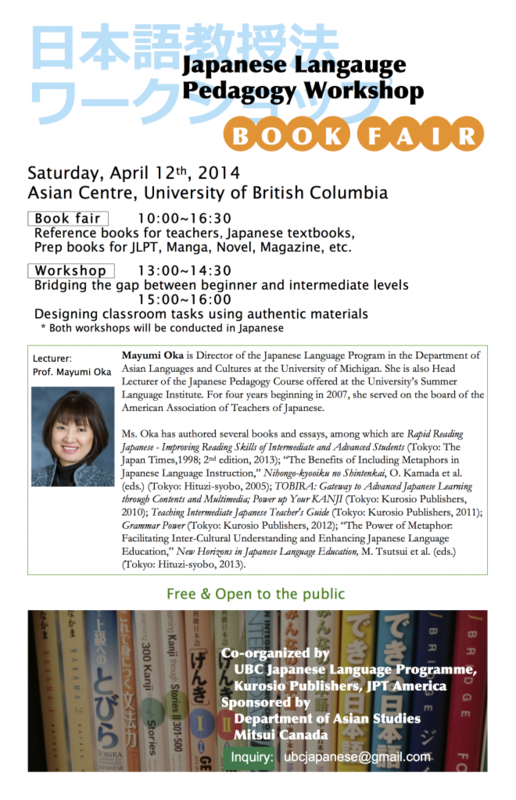 She has authored several books and essays, among which are Rapid Reading Japanese – Improving Reading Skills of Intermediate and Advanced Students (Tokyo: The Japan Times,1998; 2nd edition, 2013); “The Benefits of Including Metaphors in Japanese Language Instruction,” Nihongo-kyooiku no Shintenkai, O. Kamada et al. (eds.) (Tokyo: Hituzi-syobo, 2005); TOBIRA: Gateway to Advanced Japanese Learning through Contents and Multimedia; Power up Your KANJI (Tokyo: Kurosio Publishers, 2010); Teaching Intermediate Japanese Teacher’s Guide (Tokyo: Kurosio Publishers, 2011); Grammar Power (Tokyo: Kurosio Publishers, 2012); “The Power of Metaphor: Facilitating Inter-Cultural Understanding and Enhancing Japanese Language Education,” New Horizons in Japanese Language Education, M. Tsutsui et al. (eds.) (Tokyo: Hituzi-syobo, 2013). Book Fair: co-organized by Kuroshio Publishers and JPT America.